I have been so out of sorts lately and have been trying to get back to my happy place. We all go through times like these. Those times when we’re so quick to burn out, no matter how small the circumstances. These moments are really our body’s way of talking to us; telling us to slow down and take care of ourselves. There is so much go go go happening today that the anxiety of all our obligations can get really overwhelming. Well, I have been feeling this on every level and decided to start making better use of all my tools for anxiety relief. I have compiled a list of all my favorites that are still within a reasonable spending range. Sage burning originated with the Native Americans. However, it has been spread throughout many cultures. I loved the idea of the Native Americans using sage because of my Native American roots. Originally sage was believed to be a cleansing incense that also promoted wisdom, clarity and spiritual awareness. Some people of course, don’t buy into this ancient ritual, but I personally eat it up. I have burned sage and gone through my house after a particularly tough time or a family fight just to help clear the air. Energy will remain stuck in the air after a particularly negative time and this lingering tension can increase stress and anxiety. While the smell of sage is often something that needs to be acquired, it really does have a calming quality about it. It’s a great tool to use in the mornings before starting your day, or before jumping into an at home yoga workout. Check out my post here to see some of my favorite YouTube yoga videos. Especially if you’re looking for a calming, easy moving yoga to relax your mind, I highly suggest starting sage first. It just instantly brings al little peace to the atmosphere. that are reasonably priced and come with a cute dish to burn your sage in. To start my mornings or my yoga, along with the sage, I also turn to my trusty essential oil diffuser. My personal favorite for calm and meditation is Frankincense, but most of the time I opt for Young Living Essential Oils’s Joy. There is just something so peaceful and uplifting about the smell of joy. (wink wink) Picture it: calm and clear the room first with your sage and then bring joy and peace into the space. That’s kind of the way I like to think of it. If you struggle with anxiety, maybe you just need a little joy! Other basic oils can be used for such a big variety of things. Fun fact: studies have shown that adding peppermint essential oils under your nose during a workout actually helps keep endurance and stamina up! Athletes who breathed peppermint during their workouts even recovered more quickly than those who didn’t. Peppermint might be a good idea if you are also struggling with depression. Not only will it give you a little mental and physical boost but assistance with exercise will encourage boosted serotonin levels. that includes peppermint, lavender, tea tree oil and patchouli. There are also great essential oil roll ons that I use during the day in place of perfume. A dab behind my ears and wrists and I’m calmed for the day, or totally motivated (depending on what I need more.) There is a great kit that has oil blends specifically for things like sleep, de-stressing and energy! It’s crazy how well these things can actually work the way they promise to! If you are used to a perfume smell, then it may take a while to get used to the smell of oils. A basic starter kit like this is a great idea if you are new to oils. I love great thought provoking self help books. They can be so uplifting and motivating, but life is also super busy and I don’t always have time. During days when I’m just feeling blue, and don’t even know what to ask for or where to turn, I seem to be drawn to this daily devotional book. It’s very small and I keep it right on my nightstand and during tough times it just seems to call to me. Whether or not you are a follower of the Bible, this can be a handy go-to anxiety calmer. Each page is marked with a specific date so you can turn this into a daily ritual. The words you read each day could easily be done before a meditation time, before waking up or before sleeping at night. Those crucial times when motivating words are what you need to succeed or relax. At the end of each small reading there also will be a scripture recommendation for you to read from the Bible if you choose to . Another great thing that would be handy at bedtime is the children’s devotional they have now created. Talking to kids about prayer or Jesus can be uncomfortable if you just can’t find the words. Trying to help your child struggling with anxiety can be an added stressor as well. This book is a great guide to get your started and create a dialogue between you and your kiddo(s). Now I am not gonna lie to you, I get all sorts of mixed up about just how exactly the Pink Himalayan Salt Lamp works. When it is turned on, the negative salt ions that are released (you’d think it would be the positive ions, right?) Releasing these into the air is supposed to have a calming effect on you, similar to sage. So much so that it can boost serotonin levels and increase blood flow. Boosted serotonin levels can help ease and anxiety or depression and additional blood flow may help your brain to function more clearly. Keeping a salt lamp in a child’s room would be a great idea if your kids struggle with seasonal allergies, asthma or anxiety. While it should not be used as a substitute for medication, the properties of the salt lamp can have a soothing effect on their symptoms and yours.
. The candle holders themselves are really pretty and fit in easily with decor in any room of the house. are a tool I turn to when I just can’t straiten things out in my head. Sometimes there are two potential roads to take and I can’t clear my thoughts enough decide which one is right. These may seem a little hokey to some people but I really believe our energy attracts what we’re thinking about and can bring us the answers we need. It’s crazy how many times I have shuffled my angel cards multiple times and every time pull out the same card. The messages I receive always seem to pertain to something that is currently happening in my life. Funny thing, more often than not I get the card telling me to start making more time for self care. Again, just a few positive, uplifting words can really help guide your mind if it’s all over the place. Click on the photo for the link to my personal set of cards that I have at home. Although, there are a ton of different ones to choose from. Mala beads are another ancient tradition traced back to Hinduism. I don’t practice Hinduism yet I still get a ton of use out of these beads. I have an entire post on them and how great they can be for meditation, prayer and anxiety relief. You can read all about them here. Plus there is a discount for a really great Easy shop that makes fashionable mala beads. It’s amazing how capable we are of changing our thoughts. Sometimes it just requires a little extra effort on our part. Loaded with a few of these anxiety relieving essentials you will be set. Just like anything, take it a step at a time. 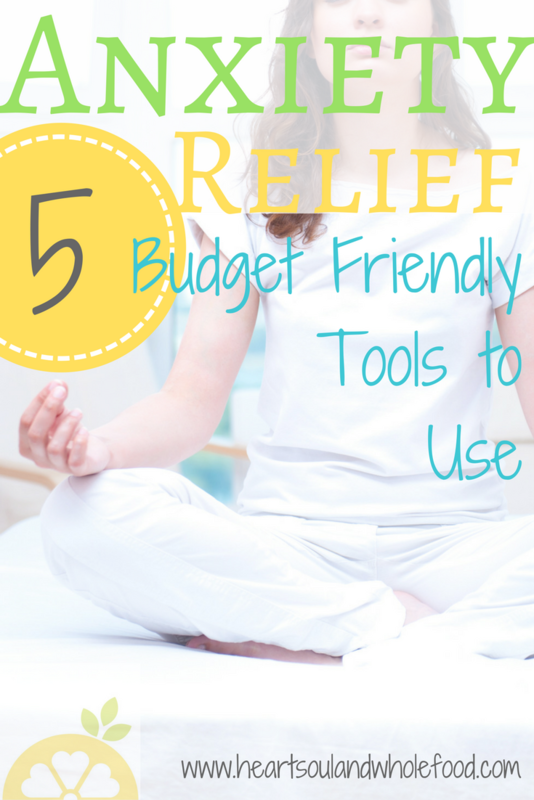 Choose a few tools that you can see yourself using and think will benefit you the most. I’ve shared a few more below that you guys might love! Anger Management: Embrace it or let it go? LOVE this post, girl! I have mala beads and a sea salt lamp! (And many prayer books!) I am going to look into the sage and essential oils, though. Anything to help with life’s stressors. xoxo! THanks! So glad you liked it! I bet you will love the sage and the oils!! There is just something about scents that can make such a huge difference!